President Donald Trump and Japanese Prime Minister Shinzo Abe pose for photographs in the White House, Feb. 10, 2017 in Washington, DC. 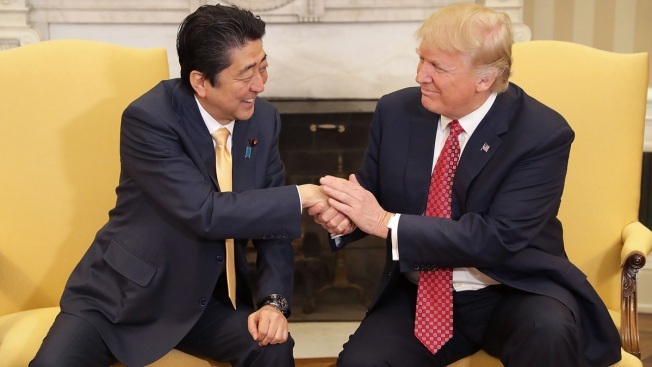 Just as President Donald Trump claimed last week, Japan's prime minister has, indeed, nominated Trump for the Nobel Peace Prize — at the request of the White House — one of Japan's largest newspapers reported Sunday. Trump boasted at a news conference on Friday that Prime Minister Shinzo Abe had given him a copy of a five-page letter he'd sent to the Norwegian Nobel Committee, which selects the annual Peace Prize laureates, NBC News reported. At a meeting of the lower house of Japan's parliament on Monday, Abe said he wouldn't comment on the report because Peace Prize nominations are secret for 50 years. But he did say: "I'm not saying it's not true."